Since 1961, Hyatt Commercial has been building success for businesses, owners, and investors—helping clients maximize the value of using and owning commercial property. We help businesses seeking space for their operations, and owners and investors looking to buy and sell commercial real estate. We provide services tailored to preserve the value of income-producing properties, including lease and financial administration, building operations, and tenant occupancy and satisfaction. We lend our expertise to investors, allowing them to uncover, participate in, and gain value in building and land investment, including property acquisition, development, and formation of joint ventures and partnerships. What makes Hyatt unique in the Baltimore-Washington area? Our combination of experience and dedicated market specialization. Since its inception, Hyatt has focused exclusively on the city of Annapolis along with Anne Arundel and Queen Anne’s counties. There’s simply no substitute for Hyatt’s industry knowledge when it comes to knowing the people, properties, and factors that make up this ever-changing and diverse market. 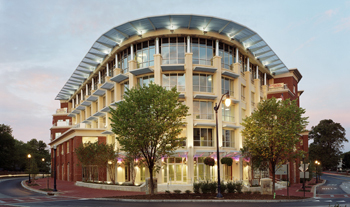 Located in Annapolis, Hyatt Commercial was founded by Louis Hyatt, whose extensive involvement in Annapolis’ civic, banking, and real estate communities has made him a respected figure synonymous with the region’s growth.